To access Google Drive you must first sign into your Google account. Once you are signed in you can access your 'Drive' account through the 3x3 apps grid in the top right hand corner of your screen. Click on the 'Drive' icon. 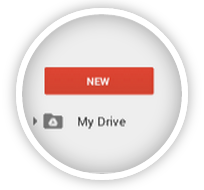 To create a Google Doc, Sheet, Slide, Form, Drawing or Folder click on the red 'New' button.